The 1932 NFL season was the 13th regular season of the National Football League. Even though the Boston Braves (the current Washington Redskins) joined the NFL before the season, with the loss of the Providence Steam Rollers, Cleveland Indians and Frankford Yellow Jackets, league membership dropped to eight teams, the lowest in NFL history. Although the Green Bay Packers had finished the season with 10 wins, the league title was determined by winning percentage, with ties omitted, so the Portsmouth Spartans and the Chicago Bears finished the season tied for first place (6–1). For the first time, the NFL arranged for a playoff game to determine the NFL champion. 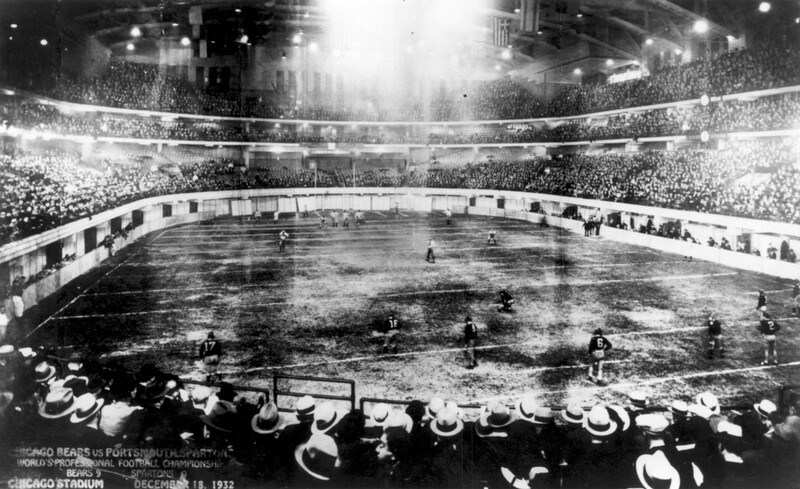 Extremely cold weather forced the game to be moved from Wrigley Field to the indoor Chicago Stadium. The makeshift football field in the stadium was only 80 yards long with undersized endzones. The planners were forced to move the goal posts to the goal line because there was not enough space to put them at the back of the end zone, as was standard in college and professional ball; apparently this change was favored since keeping the goal posts at the goal line was one of the several changes the league made to the rules starting in 1933. The Bears won the game 9–0, which was scoreless until the fourth quarter. The game counted in the final standings, which moved the Spartans to third place. The Spartans became the Detroit Lions in 1934.